“Andy is the life of the party wherever he goes, and what bigger party is there than New Year's Eve? 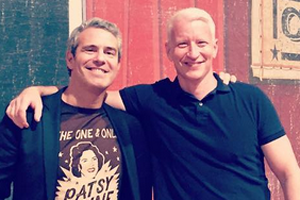 It is going to be a blast!” said CNN host Cooper, who will co-host this year's New Year's Live with the Bravo star. Cooper spends many weekends traveling with his longtime friend Cohen, doing shows around the country, including last weekend. Said Cohen: “I’ve been friends with Anderson for 25 years. We've traveled the world together and performed in 30 plus cities with AC2 and it's all led to this one huge night!"